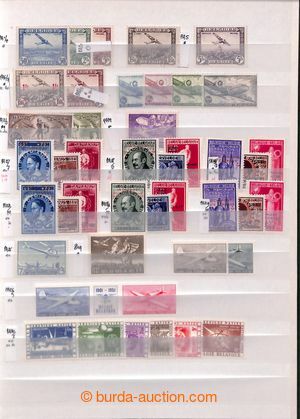 1942 WAR FORGERIES, cat. 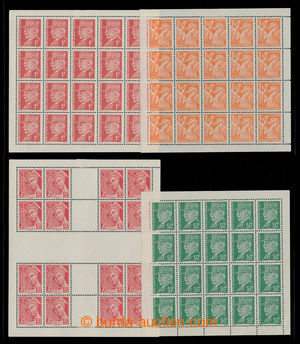 Maury 2, 3, 5 , 7; 50C and 1Fr Petain, 1,50FR Iris and 30C Mercure; very fine and complete printing sheet, 3x 20 block and 1x 16 block; cat. 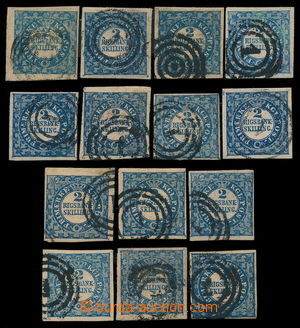 as single ** stamps 1.670€, complete printing sheet are very rare! 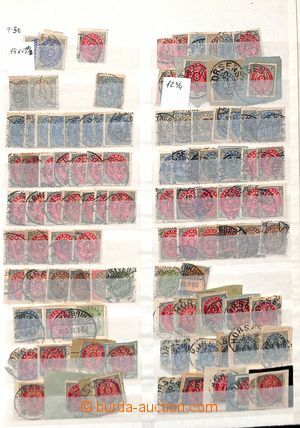 1850-1918 [COLLECTIONS] collection mainly of used stamps in 16-sheet stockbook, from the first issue, various values, postmarks, types etc., also newspaper, postage-due, sets of Bosnia and Herzegovina (part mint) etc., supplemented with 4 smaller stockbooks with specialization on postmarks (all identified according to catalogue Votoček) and 2 choice notebooks; high catalogue value, it is worth seeing, ex. Zdeněk Ryvola! 1885-1986 [COLLECTIONS] Scandinavia - semifinished collections of Denmark, Norway, Finland, Iceland in 4 albums Schaubek; Finland 1885-1986 and Denmark 1875-1986 relatively strong with mostly complete sets from 1920 etc. 1850-1950 [COLLECTIONS] AUSTRIA, GERMANY, SWITZERLAND, NORWAY, FRANCE, USA mixed accumulation of entires from various countries, mainly Europe, by estimation more than 400 pcs, contains also many interesting items as letters from Austria-Hungary with first issue etc., part commercial correspondence, Reg, Ex letters, major part of entires from period of WW I. and WW II, contains censorships etc. ; various quality, more than 1,5kg of material! 1870-1970 [COLLECTIONS] ACCUMULATION in full IKEA box in 19 stockbooks, contains: Brazil, Argentine, Peru, Chile, Paraguay, Uruguay etc., small part of classic period, mainly used, various issues, incomplete sets, especially cheaper values, all more often; various quality, a lot of material, over 26kg of material, ONLY PERSONAL PICKUP!